Buying jewelry can be an intimidating prospect for many men, and that often leads to mistakes and overspending. 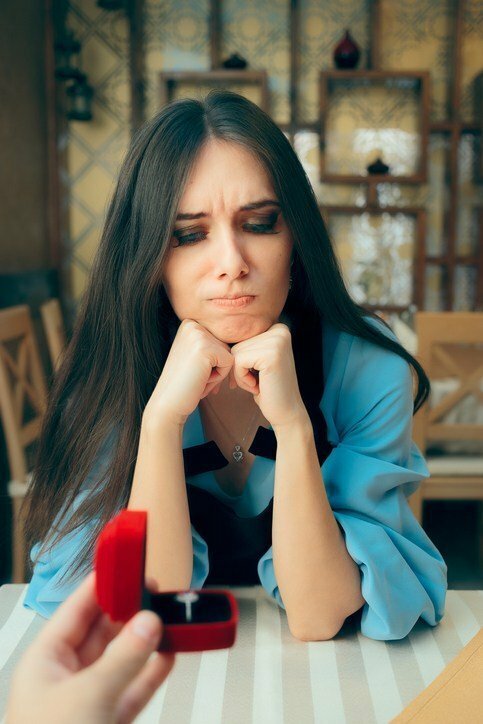 Whether you are buying a pair of diamond earrings for your wife or choosing an engagement ring for your soon-to-be fiance, it is important to avoid these common mistakes. Jewelry is a specialized product, and jewelers have their own terms and language. If you do not understand the terms, you could end up making a purchase you later regret. Take the time to educate yourself, and learn as much as you can before making any purchases. Not sure where to start? We recommend starting with educating yourself on the Four C’s of Diamond Quality the GIA is a great resource for this information. Purchasing something as important a diamond engagement ring is an emotional purchase by nature, but you should not let your emotions cloud your judgment. That can be hard to do, but it will pay off in the end. Contrary to many people’s belief, bigger is not always better. Not at least, when it comes to diamonds. Just because a stone is sizable, does not connote quality. Diamonds are rated on a number of different characteristics, and carat size is only one of them. Choosing a diamond based solely on its carat size is a huge faux pas. If you ignore a stone’s other qualities ( cut, color, & clarity), you run the risk of picking a lower quality diamond. It is important to ask the jeweler any questions you may have. Do not be too proud or too stubborn to ask for help when you need it. Any reputable jeweler will be happy to aide in your education. As with any purchase, the more you know, the easier it is to make a good decision. Are you ready to make a purchase? Contact the experts at The Diamond Reserve to schedule a consultation.